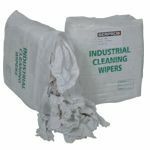 PADS: 100% recycled waste fibre. 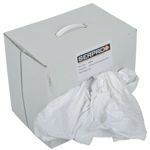 EVO natural fibre oil preferential absorbent pads offer the superior absorbency of natural fibres in easy to use sizes. 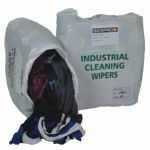 They are cost effective as they can absorb up to 70% more oil per pad than equivalent weight polypropylene pads, yet are competitively priced and will have the lowest Carbon Footprint of any similar product in Europe. 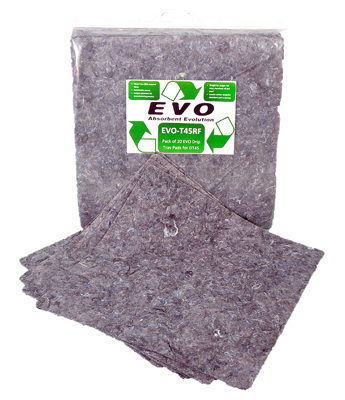 EVO Oil Preferential Pads are manufactured from 90% recycled fibres and are designed for use on all hard surfaces and on water to absorb oil and fuel spills. 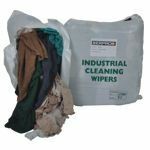 They can also be used for cleaning up spills of animal, vegetable, mineral and synthetic oils, and oil-based paints. 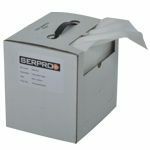 These pads have been designed for use in the industrial, commercial, automotive markets, and marine and manufacturing industries. If using the pads to absorb dispersed oil they should not be exposed to water for extended periods. 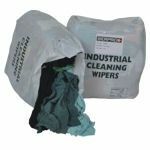 These pads are not suitable for use with strong acids and alkalis.